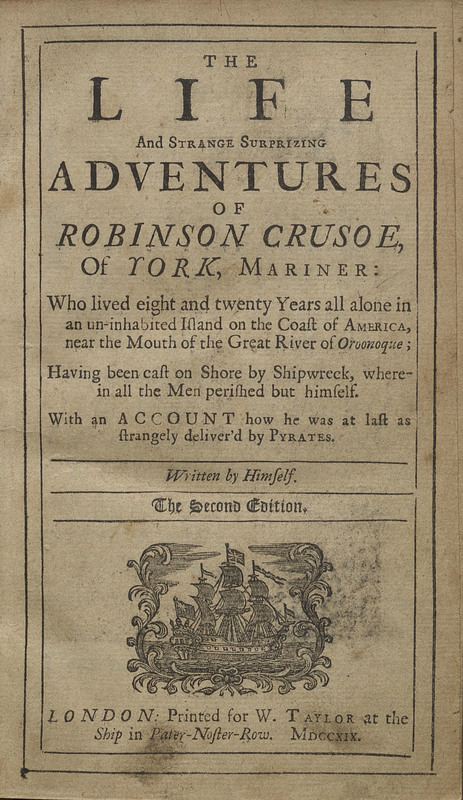 Considered one of the first English novels, Robinson Crusoe is Daniel Defoe’s most famous fictional work. 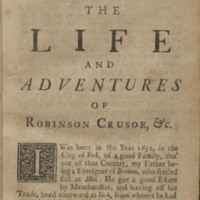 Written in vernacular language, which was unusual for the time, with detailed imagery, the novel was initially published as the autobiography of Robinson Crusoe, a middle class Englishman who left home against his father’s advice to seek adventure. 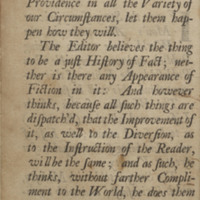 Identified as a fictional work in later editions, the novel explores the punishment of disobedience to God and the possibility of redemption through the use of allegory. Crusoe’s capture and enslavement by pirates and long period of abandonment on the island serve as the purgatory that Crusoe needed to endure to earn the reward (heaven) of rescue from the island and return to civilization (God’s grace). Shown is the title page of the second edition. 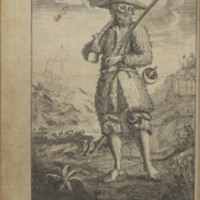 The facing frontispiece depicts Robinson Crusoe in goatskin clothing. He is shown carrying two rifles and wearing a sword in the foreground, while a ship is tossed on rough seas in the background. 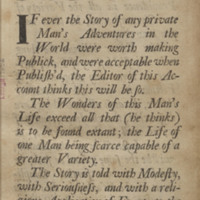 The Life and Strange Surprising Adventures of Robinson Crusoe, of York, Mariner: Who Lived Eight and Twenty Years All Alone in an Un-inhabited Island on the Coast of America, near the Mouth of the Great River of Oroonoque; ... With an Account how He Was at last as Strangely Deliver'd by Pyrates. London: W. Taylor, 1719.